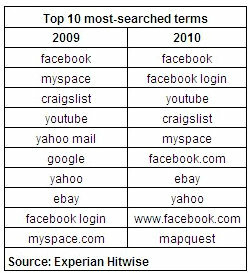 According to search volume research, Facebook was the number one searched phrase in 2010, with phrase variations of Facebook dominating the top 10 spots. Experian Marketing Services has analyzed the top 1000 search terms for 2010 and found something that might, or might not, surprise you. Based on their research, the word “Facebook” was the most overall searched phrase in 2010. This is now the second year in a row that the word “Facebook” has dominated searches in Google. Other interesting findings come throughout the top 10 rankings where you find variations of Facebook scattered throughout the top ten slots.